This is not the first time I found myself hunting down something wedding-related along the West Coast. Months ago it was a wedding venue and this past weekend it was succulents. Not just any succulent, a particular one which I’d love to have on my tables, maybe in my bouquet and perhaps even for the groom’s buttonhole. I can’t tell, so I’ll call it the secret succulent. Sadly for me it’s become quite a trend for brides and some have even used it on their cakes. They really look so good amongst flowers and add a sprig of ‘indigenous green’ to any garden wedding. So when we spent the weekend in Paternoster with his family, we had high hopes that the West Coast would produce the goods and in abundance. On the day we arrived, I spotted three of ‘my’ succulents in pots on the neighbour’s stoep. Turns out the owner lived there, couldn’t tell me where I could find more and said I could take a piece of hers. Turns out we road tripped up on the weekend of the biggest storm this little fishing village has seen in four years. The wind howled, the rain pelted on the roof keeping everyone awake and it was way too cold to leave the fireside. But the minute the clouds parted for just a second, we jumped into the car and drove through town and off road. Vaughan had his Go Pro video camera in hand, trailing the landscape for colourful flowers to film, whilst I kept my eyes firmly on the sandy soil. We saw fields of yellow flowers, aloes, cacti, and many similar succulents but not mine. We would have carried on going, had the sand not gotten softer. So we had to high tail out of there, before we sank and didn’t have a choice. When the sun came out, we walked amongst the self-catering apartments, past little gardens and towards the beach. The white and blue seaside houses boasted the prettiest indigenous gardens and succulents, but again mine was missing in action. 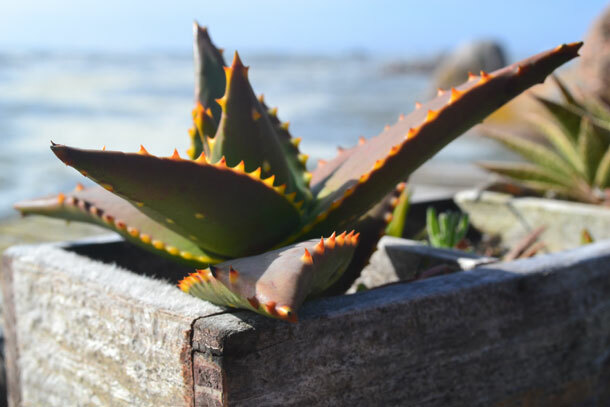 So in the end all I left Paternoster with as a tiny stem of the neighbour’s succulent and a number of a man selling them who is yet to answer his phone. Turns out I remain a stalker of succulents. If you see me bent over, eyes trailing through foliage, don’t pity me. Instead give me a wave. Because when you reach the flower stage of wedding planning, you too may find yourself searching for something you never imagined you would.